Installment #8 - May 1, 1999 - Mountain View. That's Right, Mountain View. Installment #8 - May 3, 1999 - Mountain View, CA. Yep, Mountain View. May 1, Morning: I'm calling from the Greyhound bus station in Palm Springs. I'm on my way home - should be getting home around 10:00 tonight. My blisters are getting worse, and it seems to me that the most sensible thing to do is to go home, get a new pair of shoes, and let 'em rest for a while and then try it again. 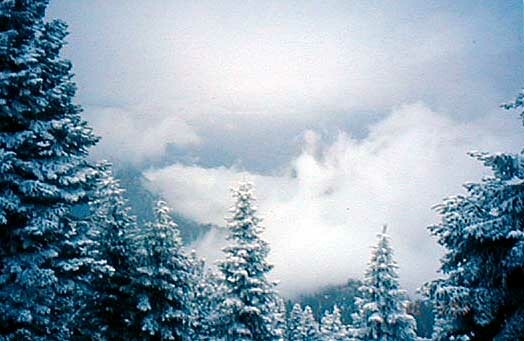 We left Idyllwild, went through about six inches of snow or so. Yesterday was a long day - 20 miles coming down hill through snow initially and then rain. Now I'm down at one of the low points of the trip in elevation where it's warm. But my feet were getting worse. The group had gotten ahead of me. I'm heading off into a 60-mile stretch of mountains - alone - with both feet in bad shape. It just didn't seem to me to be a sensible thing to do. So a Trail Angel, Don Middleton from Whitewater, brought me down here to the bus station, and I'm about ready to head home, rest up, and then hit it again a little bit later. I'm home soaking my feet. I'll write up and email to you a progress report Sunday or Monday. I hope to get better shoes, heal my blisters, and get back on the trail. Bob, the manager of the Tahquitz Motel in Idyllwild, loaded us (Jason & Lara, Jonathan, me, and - 2nd trip, Yip and Charlotte) into his Diesel Mercedes and drove us to the trail head where the Devil's Slide trail ascends about 2000 feet, and 2.5 miles, back to the PCT. We met Hal at the trailhead headed back to town; he had been out overnight and had decided that his equipment was not adequate for the cold weather. Up the trail a bit, we ran into Nathan, who had left Idyllwild early that morning but had trouble following the trail, which was hidden under four inches of new snow. He had lost the trail, gone cross-country, run into his own tracks, and decided it was time to retreat. So the seven of us hiked back up to Saddle Junction (where the Devil's Slide Trail intersects the PCT) and, at about 2PM, started north again. 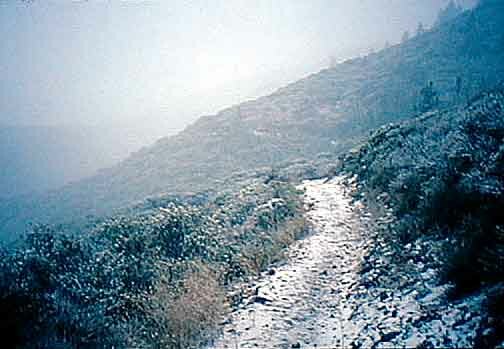 Many features of the trail are visible under four inches of snow, so it usually wasn't hard to follow, but every once in a while we would lose it. Then we would fan out looking for it, and when someone found a positive indication of the trail (a saw-cut tree, a water bar, a straight cut through the bushes), they would holler and we would all converge on the spot and continue from there. By the time darkness was approaching, we had reached Fuller Ridge, having hiked about 8 miles from Saddle Junction. It snowed a couple of inches overnight, so we awoke Friday morning to about six inches on the trail, and more coming down. There were many places where the new snow hid ice-covered rocks, and most of us took a tumble or two during the morning, but by early afternoon the trail was beginning to descend, the snow depth was decreasing, and the falling snow changed to light intermittent rain. Looking at the elevation graph for the first 200 miles, you can see what looks like a steep decent from 8500 feet to 1700 feet. In fact, the descent is maddeningly slow: we hiked along seemingly endless switchbacks that seemed to have almost equal amounts of up and down, but in fact we were slowly descending, and by 5:30 we reached Snow Canyon Road at about 1700 feet. 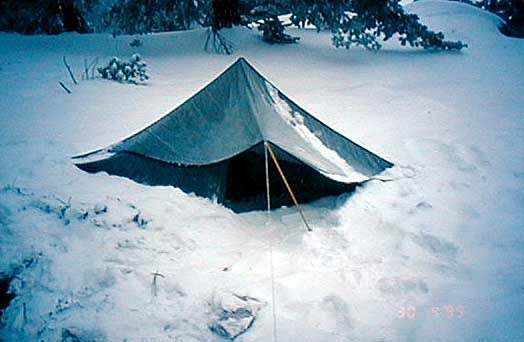 Here there was a water fountain, and the group stopped to cook supper, and dry wet sleeping bags, tents, and socks. My feet had been hurting more and more as the afternoon progressed, and I was the last to reach the fountain, shortly before the group packed up and moved on. I decided not to try to hike further but to spend the night nearby and rest my tired feet. The blisters on the ball and heel of my left foot were complaining loudly, and the ball of my right foot was very tender, although no blister was visible. Saturday morning dawned clear and sunny, and I set out alone down Snow Canyon and across San Gorgonio Pass, which is very windy and is dotted with windmills. By the time I had crossed under Interstate 10, my feet were again sore, and I stopped to check them out, discovering I now also had a blister on the ball of my right foot. I passed a sign posted by "friends of the trail" Don & Helen Middleton offering to put PCT hikers up for the night. I located their cabin, and could see from the familiar footprints that at least some of yesterdays group of hikers had been there. I hoped to ask for directions to the nearest place where I could buy a new pair of shoes, because I had decided that part of my blister problem was insufficient padding on the balls of my feet. Finding no one home, I set off again, but stopped after a few hundred feet. Here I was, hiking off into the wilderness alone with perhaps 60 miles to the next town. I would be climbing back up toward 9000 feet and could expect more snow navigation. I was not carrying enough clothing to keep me warm standing still in cold weather - that amount of clothes would be too heavy and too bulky to carry. My safety is based on my mobility (I would keep warm by hiking, or by camping and climbing into my sleeping bag), and my mobility was much reduced by my sore feet. I decided it would not be wise to continue. The idea of going home, resting my feet, and changing my shoes hit me suddenly, and within about 30 seconds I had decided to do just that. I turned around and retraced my steps to the Middleton's sign, then kneeled down to copy the address and phone number. When I stood up and turned around, there was a man walking toward me. 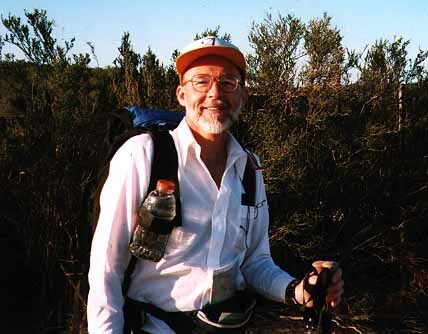 Don Middleton had hosted my six traveling companions in his storage cabin the previous night. Now he was going to the cabin to replenish the food they had eaten. I climbed into his truck and we drove to the cabin, which had a trailer on one side, a motorhome in front, and was surrounded by piles of stuff. In front was a sign saying "Welcome" and on the boarded-up front window was a sign saying "No Trespassing". Nearby was a solar panel which was connected to a single light bulb and to a red rotating beacon sitting in an old chair. Inside the cabin was a fireplace, several couches, and a log book which contained entries by each of the hikers he had hosted so far this year. I added my entry to the log, we drove down to his house where I met his wife Helen, and then he drove me to the bus station in Palm Springs. By 11:30AM I was on the bus, on my way home, with strongly mixed emotions: I hated to leave the trail; it had been hard to get started again and leave Idyllwild after resting in the motel and I knew it would be even harder to leave home for the ten-hour bus ride back to the trail - I was afraid that, once home, I might decide to stay there. But going home has a strong appeal for the obvious reasons, and I felt that going home was the right decision: I have had blisters for over 100 miles now, and sore feet were all but eliminating the joy of hiking. When my feet recover I will be a happier, and a safer, hiker. The amount of water carried is a delicate balance: too much water means unnecessary weight in the pack and strain on the body. Too little can mean uncomfortable, and perhaps dangerous, dehydration. I carried too much water. I always assumed that the questionable water sources would not be available, and I even planned for missing the hidden water stashes placed for us by the ADZPCTKOP (first Annual Day Zero Pacific Crest Trail Kick Off Party) sponsors. This has been a wet year. I'm hiking early in the season. Water is available almost everywhere. I should carry less and take a load off my feet. I made some adjustments in my equipment - I sent home my scale, my ham radio, and one of my hiking poles. I will add scissors for shaping molefoam bandages. I had too many thin nylon socks and not enough padded socks. I have gotten more organized over time: everything in my pack has its place. I've gotten better at deciding in the morning what I am likely to need during the day, and packing so that it is accessible. At my present state of fitness, more than 20 miles a day is a stretch. I do not expect to be able to make up the time I am losing while my blisters recover, so my schedule will slip. Hiking the trail is a gas! There are lots of interesting people to meet, lots of beauty to observe, and challenges to meet. 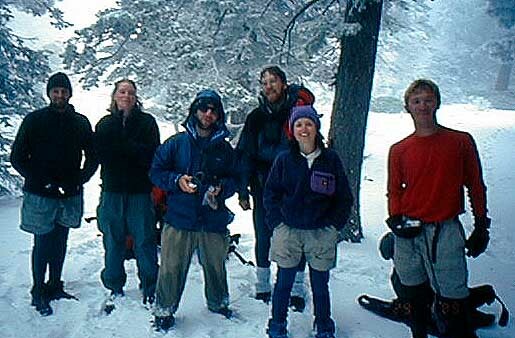 In the first 200 miles I have hiked in desert conditions in temperatures near 100 degrees, and in a snowstorm with below freezing temperatures and the trail hidden under new snow. I've hiked with college students and retirees, ranging in age from 17 to 77. I've hiked with people who are very familiar with the trail and willingly offer guidance and suggestions. Everyone has been friendly and it is reassuring to know that there are others out there who would do what they could to help in times of trouble. 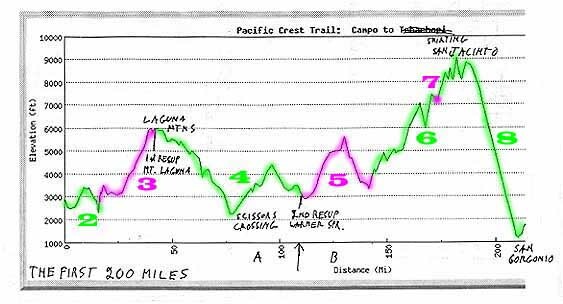 Trail Angels like Greg, Charlie, and others who organized the ADZPCTKOP or like Don Middleton who put himself at my disposal ("You can stay at my place until your blisters heal, or I'll take you where you need to go") are a wonderful part of the trail experience. Acts of unselfish kindness from strangers, in my experience, are rare in general, but are common along the trail, and are a big part of what has made my hike magic. I have to admit that our friend Mr. Downs did sound a wee bit dejected in the May 1 morning message, which was left on my answering machine. But I have a feeling that a few days' worth of all those vile bourgeois amenities - good food, running water, comfortable bed, cozy temperatures, perhaps a foot massage or two - will catapult him back onto the trail again in no time! 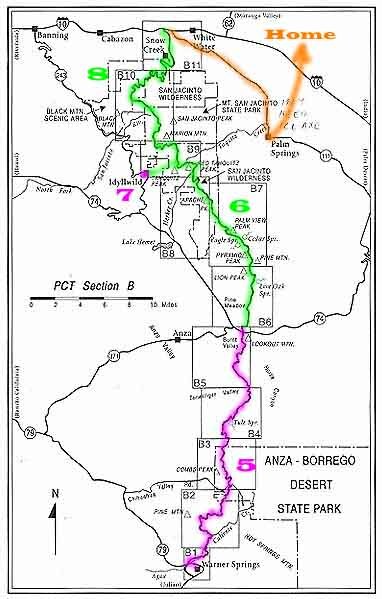 The Chapter B Map arrived in the mail from Allen today, and I've marked it up to show his progress from the time that he left Warner Springs a few days ago. Also, the Elevation Map has been updated as well. And here's a picture of Allen as he'll appear in a few days when he hits the trail again - rested, recovered, revived, and rarin' to go!